Altaf Hussein is the supreme leader of the Muttahida Quami Movement, the third largest political party in Pakistan. He has lived in exile in Britain for nearly 13 years but continues to rule the hearts of the Mohajirs in Sindh. The volatile metropolitan city of Karachi is an MQM stronghold. In Pakistan, migrants from India are called Mohajirs. They nurse a feeling of being culturally, politically and economically discriminated against when compared to the native Sindhis and Punjabis. Hussein was a student leader in Karachi when he entered politics. A pharmacist by training, his career received a boost when he was backed by General Zia-ul Haq, who used him to divide the polity of Sindh. Subsequently, the MQM had a major confrontation with the Pakistan army, when Hussein's supporters killed a senior army officer. Eventually, the unbearable political pressure and attempts on his life forced him to flee the country. By articulating the woes of Mohajirs, Hussein has built up a formidable front which shares power in Islamabad and in Sindh. Lately, he has changed his party's name to the Muttahida Quami Movement to enlarge its vote bank. His equation with the army also changed after he opted to side with General Pervez Musharraf, also a Mohajir. His recent Indian tour, his first outside the UK in 12 years, attracted attention when he addressed Indian Muslims and advised them to be loyal to India. His father, Nazir Hussain, was an officer with Indian Railways in Agra before migrating to Pakistan after Partition in 1947. Though on a private visit to India, he was given VVIP status, provided security cover. Before his arrival dozens of his assistants arrived in New Delhi from Karachi and London to publicise his visit. In an exclusive interview with Senior Editor Sheela Bhatt, he refused to criticise General Musharraf. From the 1940 Lahore resolution (when Mohammad Ali Jinnah said Hindus and Muslims belonged to two separate and distinct nations and therefore they can't live together) to current times, how do you see the Muslims movement for a separate nation? That was a historical blunder. I have said many times publicly that the division of India was the greatest historic blunder in the history of mankind. The British hatched a conspiracy to divide the land and people. The forefathers of the Mohajirs have sacrificed two million lives to create Pakistan. But we were being treated as third grade citizens of Pakistan. They don't consider us as loyal citizens of Pakistan. The situation is similar over here (in India). Muslim loyalty is doubted. What have the Muslims of the Indian subcontinent got? Nothing! They are suspected on both sides of the border. If we are not happy there and if most Muslims are not completely happy here, we should think about it. Muslims here question what will happen if a Hindu sarkar comes to power? I request all the Muslims of India to please, please understand and don't repeat the mistake of 1947. India is your homeland. India is your forefathers' land. Never leave India. If you leave your forefathers' land, you will face the same consequences we, the Mohajirs of Pakistan are facing. Try to learn lessons from the plight of 3 lakh stranded Pakistanis in 66 Red Cross camps in Bangladesh for the past 30 years. They are living miserable lives. I request the Muslims of India to consider India as their own country in the depth of their heart. I also request the Indian government to treat Muslims in such a manner that would help remove apprehensions and insecurities from Muslim minds. For Muslims of India it is better than any other country of the world. Your views on India's partition are severely criticised in Pakistan. Do you face political problems? The truth is what I have told you. Truth is always bitter. Criticism is a part of the game. Neither before, nor today have I said anything against Pakistan. I have not said that Pakistan should disintegrate. I am saying that partition was a mistake. It's done. Now we should live in peace. Don't fight now, for God's sake. We have fought three wars. At least now look at the European Union. They had bitter conflicts than us but now they have learnt their lessons. They have the same currency, no visa restrictions and friendly relations. Let's start a dialogue and have friendly relations. Let's increase trade. We must respect each other's existence. We need to respect each other's sovereignty. Enough is enough. We better start a new era of love and tranquillity. You know more about the political problems on both sides. Just recently the home ministry in New Delhi issued a statement that the Hurriyat has been asked by Pakistan to not talk to the Centre. I'll request the establishment in Pakistan to please not give a dictation to the Hurriyat Conference. Let them have a dialogue with the Centre. I'll demand the Indian government not to issue such harsh statements which will increase more hurdles and hatred. The bigger problem lies vis-à-vis the credibility of General Musharraf who is after all the architect of the Kargil war. I know well about the Kargil issue. I also know that the Pakistan army takes decision through consensus. How is it possible that a decision like Kargil can be taken by one general? If at all a decision was taken, it was by consensus of the generals only. Recently President Musharraf has said that a plebiscite in Kashmir is not the only option. He has said this for the first time, no one has said it in public before. He took a very courageous stand regarding the issue of Kashmir. 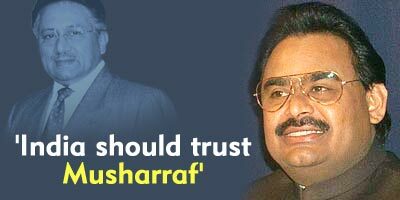 I think India should trust Pervez Musharraf. Without trust the negotiation process will fail again. What solution do you have in mind? For 57 years, both countries are tolerating the Line of Control. For the time being, just for a short period consider LOC as an International border. Just to start a dialogue. To start from point zero consider it a temporary International Border. And let trade and relations flourish. The Pakistani establishment is against this idea more than India. We have to work with sincerity. If we don't trust each other the current peace process will fail as it has failed hundred times before. If they don't want to reach the conclusion then, come on! Go to war! Win Kashmir! If Pakistan wins it, let it take it. If India wins it let it be with India. But we don't want war. A majority of people are poor. All of them want peace, peace and peace. Governments should not waste time. How was your meeting with Foreign Minister Natwar Singh? I requested him to expedite the peace process. Personally, and on behalf of millions of people I requested him to open the Karachi consulate as soon as possible. Also, the Khokhrapar and Munabao border. He promised to open it very soon (the Karachi consulate). Putting any condition to open the visa facility in Karachi will further worsen the condition of the public. Why have you changed the name of your party? Is it a shame to be known as Mohajir? Why have you replaced it with Muttahida (unity)? When my people got elected and went to other parts of Pakistan they found that ethnicity and those groups are part of the system that is medieval and feudal. We saw the feudals of Punjab and Sindh, they live like one family and poor people known as Mohajirs or Balochis and others are fighting between themselves. The feudals manipulate the ethnic and poor communities and the poor end up fighting. So we changed our name to fight poverty. We want to unite against mullahs and feudals. We have learnt a lesson from divided India. We don't want any further division of Sindh. No. We don't want division on ethnicity. Sindh is our motherland. We will live with Sindhi people and die together. We have an understanding with Balochis. We collectively issue press notes too. We support their struggle. Recently, when the army started an operation I opposed it even though I am in the government. I am not a slave of the government. In Pakistan some of your critics have dubbed you as an agent of India. When I talk about friendship and love they can't bear it. If my just demand makes me an agent of India or agent of America you can say that I care a damn! These are baseless and concocted allegations to malign my image. Why should I worry when I am not an agent? Many years back you had demanded Hong Kong type status for Karachi. How far would you go? I have never demanded any such things. I never gave any such statements. They are all rumours. How many cases are pending against you? No case was registered against me when I left Pakistan on December 27, 1991. All the cases were registered against me while I was in exile. Now, I have more than 500 cases. When are you going back to Karachi? I always tell my people that whenever my central coordination committee thinks fit I'll come back. Over the phone I ask them, shall I come back to Pakistan? My awam (public) says resoundingly -- No! Where is your ancestors' home in India? My parents Nasir Hussein and Khursheed Begum belonged to Agra. They lived in Maqbul Mahal, Hakimo Gully, Nai ki Mandi. I will certainly visit my parent's home. I don't know what the condition is. My parents never wanted to migrate. My elder brother forced them to shift. He migrated before them and then he forced them to migrate. We were eleven brothers and sisters. I am born in Karachi. Are you going to Kashmir? Inshallah, I'll go to Kashmir when its solution is found. Kashmiris should have their say in its final solution. How are you feeling in India? Aisa apna laga, jaisa apna kabhi aur kahin nahin laga. (I felt so at home here; never before have I felt this much warmth at any other place.) I haven't yet seen much of India. But India is quite friendly. I feel oneness with people. I don't see any strange eyes. I feel at home.